The other day, we announced the synopsis for the two-hour season finale of “Once Upon a Time.” However, this press release just left us OUAT fans with many unanswered questions. Fortunately, TV Guide and the executive producers had their 13th Lighting Round. This Lighting Round reveals some spoilers so continue reading at your own risk. Will we learn why Zelena needed Regina’s blood? 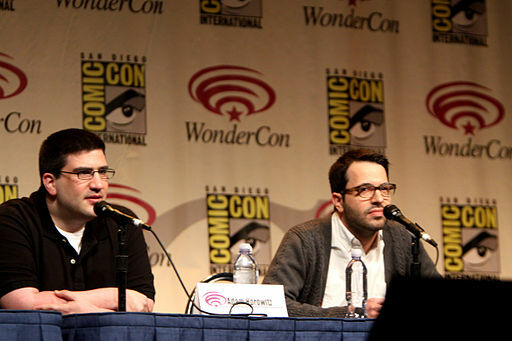 Edward Kitsis and Adam Horowitz said that it was just to confirm they were sisters and deal with the blood lock. Will fans learn more about what happened during the missing year? Kitsis took this question and said that they are done with the missing year for now. How did Hook find Emma? Kitsis confirmed that we would learn how Hook found Emma. Horowitz said that is something they will explain in regards to the missing year. They have not forgot that piece of the puzzle. It will all make sense in the finale. Emma lost her powers when Zelena cursed Hook’s lips. Will she get it back? Rumple proposed to Belle in the last episode. Was that a distraction or real? Kitsis and Horowitz confirmed it was genuine. Maurice is returning in the finale. Does this mean we learn about Belle’s mother? Horowitz said that we won’t learn about that this year. When Snow and Charming’s baby was born, the lights flickered. Will we learn why that happened? Since Regina is on the track of redemption, does this mean she is off the hook for all the evil things she did in the past? Horowitz said nope. Kitsis said that she is not either. Each day we work towards being a better person. Sometimes, we give into weakness and other days into strength. In the finale, will anyone die? Kitsis confirmed there would be another death in the finale. It could be a major character or it could be the Henchman number four. They aren’t revealing who will die, but someone will die. We met Dorothy this season. Will be learn more about her character? We saw Dorothy use her silver slippers. Will those famous shoes come back into play? We are learning more about Robin Hood. Does this mean we can expect to see more of him next season? Horowitz could not confirm whether or not we will. For the next season, will we see new realms? With Jared Gilmore aging, will there be another time jump for the next season? Kitsis said that Jared is essentially the same age as Henry. They haven’t stopped his growth any. Will we see Henry and Roland together bonding? We will learn or see more in Sherwood Forest? Kitsis said that we won’t learn anything else about Sherwood Forest this season. However, Horowitz confirmed it is a possibility in the future. Will Charming and Robin Hood become friends? Kitsis said they seem to be on good terms. They bonded well together in the Rapunzel episode. Bothe producers said they will have a common grounds, but not necessarily towards a night out together. We learned that Michael Socha will be in the next season. Will we see him in the finale? Both producers said that we won’t. Horowitz said that she will, but just not this year. Will we ever see Rebecca Mader after this season is over. Both producers confirmed that we will see her again. Has anyone read the entire fairy-tale book? If so, does this mean they know the future? Kitsis sounded a little shock to that question and just said that he can’t say. Rooting for Emma and Hook finally getting together!! !